Modern coverages take one of two approaches to confuse the Quarterback and Offensive Coordinator. Some defense’s will align the same on almost every snap but morph into different coverages after the snap. This stops the Quarterback from making simple pre snap reads. The other way defenses like to keep the offense off balance is by presenting a variety of different looks pre-snap. This movement can stop the Quarterback from knowing exactly what the defense will be running once the ball is snapped. This creates a problem if the offense is trying to get the ball in the hands of their best receiver by having the coach call the route or the Quarterback giving him the route based on pre-snap leverage. The solution to this is the Win Route. The Win Route is a simple 6 step speed out that can convert to a Corner vs Cloud coverage. This route takes some time and reps to master, but once your receiver and Quarterback are on the same page, it can force the defense to allocate two defenders to the outside receivers which will open up the middle of the field. I have found the best way to teach the route to the receiver is to give him very clear rules. This helps ensure that both the receiver and the Quarterback will be making the same read. The default route for the receiver is the 6 step speed out. He will run this route and expect the ball to be delivered on the second step of his break. This route normally breaks around 7 yards. While a 7 yard gain is always nice, the Wide Receiver then has the ability to break a tackle from a Cornerback and gain more yards down the sideline. If the Cornerback is playing the flats and trying to get under the route, the receiver will convert his route to a Corner so he can get to the open space. The rule for the receiver is that if he gets even with the Corner he is going to run past him. This becomes a natural read for the receiver and Quarterback after a couple of sessions of drilling the route. The Win Route is especially effective as an initial route on a longer passing concept. The Quarterback can almost always determine if this route is open within the first second of the play. This makes it a great compliment to the Mesh or Y-Cross concepts. The Quarterback takes his initial read on the outside and then comes back to the inside routes. This moves any defenders who are reading the Quarterback’s eye outside while giving time for the concept routes to open up. When run effectively the Win route commands double coverage on the outside receivers. This not only opens up the interior routes, but also opens up the run game. 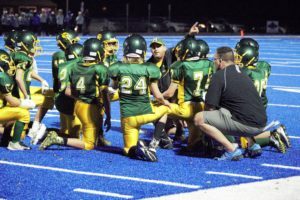 While it takes an investment of practice time, it can take the pressure off the play caller and allow the players to adapt to what they see on the field.